So, you have decided to take a vacation to Universal Orlando Resort!! Congratulations! Now, where are you going to stay? The following is an overview of my personal opinion and experiences with the Universal onsite resorts. 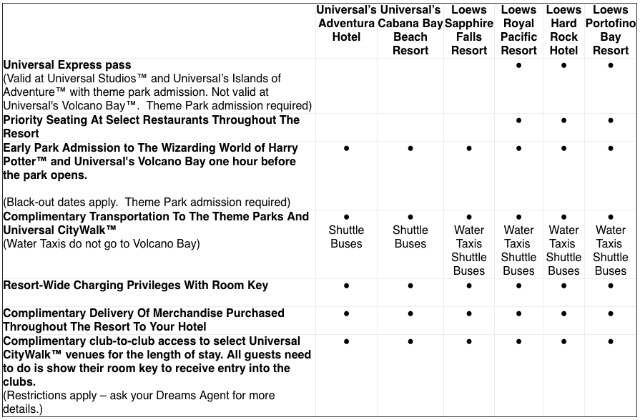 Universal Orlando (USO) separates their resorts in the categories of Prime Value, Preferred, and Premier. 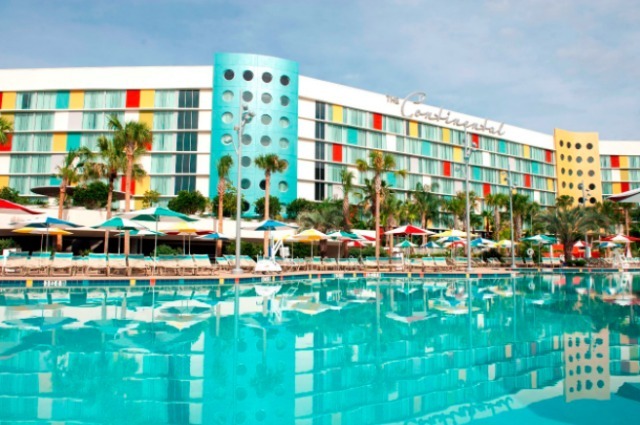 Universal’s Cabana Bay Beach Resort was Universal’s first step into the Prime Value category. 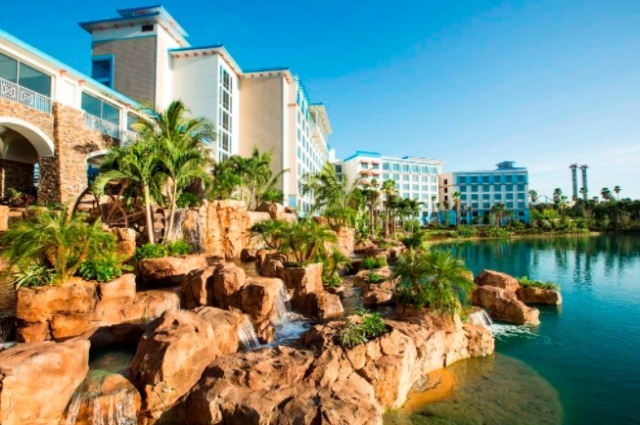 With 2200 guest rooms, this is the largest resort onsite. Offering standard guest rooms, family suites, and two-bedroom suites, this resort can accommodate up to eight guests per room. With the theming of a 1950’s/1960’s beach resort, there is an abundance of fun, colorful activities. The resort offers two pools (one with a waterslide and the other with a lazy river), fitness center, bowling alley, arcade, and a few play areas for children. Cabana Bay offers dining in a food court, poolside lounges, table service in the bowling alley, and a Starbucks. We have stayed in both a standard room and a family suite. I love the suite layout as the bathroom makes it so easy for multiple people to get ready for the day. The resort offers a fire pit in the evening for guests, and who doesn’t love a good s’more? You can purchase s’more kits in the food court. The shower is located in a separate area than the toilet for ease of access. The resort has a great layout with easy access to the main building from all rooms. The amenities are more accustomed to a four-star resort, so this resort offers great bang for your buck! Parking is outdoors and will cost $12 per night. If your room is in the newer towers, you can park in the small parking garage to access your room much easier for the same cost. I travel often with my husband and 14-year-old daughter, so I also feed off of their experiences. While we have enjoyed our stays at Cabana Bay, we find there to be a little too much ‘activity’ at this resort for our taste. We prefer a slower, more relaxed pace when we return to our resort at the end of the day from the theme parks. USO will be opening another Prime Value resort named Universal’s Aventura Hotel in August 2018. Like Cabana Bay, there will not be Universal Express passes included with your stay here. The hotel will feature a rooftop bar that promises amazing views of both the Universal theme parks and the Orlando area. This hotel will also feature a food court, multiple pools, Starbucks, and fitness center. I look forward to checking this out next summer! Stay Tuned. 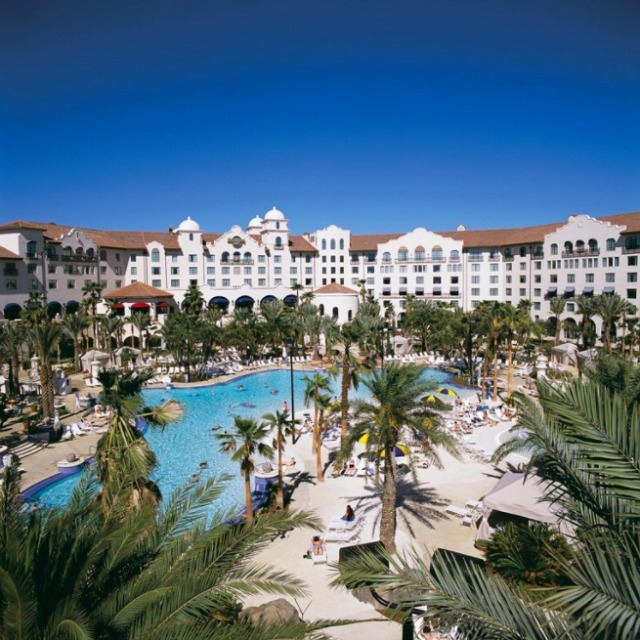 Loews Sapphire Falls Resort was the second Preferred level hotel built onsite. This resort opened last year, and I was able to stay one night. I really enjoyed the island décor and the tropical vacation feel of this resort. The décor is very Caribbean with cool blues and dark wood contrasts. The rum bar in the lobby is stunning to look at and also offers an extensive rum menu. Sapphire Falls offers a huge zero entry pool with a waterslide, hot tub, and a children’s play area. This pool is amazing! There is a “sandbar” that you can walk across the pool on, to make getting to the other side both fun and easy. Walking to the parks is much more manageable here than Cabana Bay, as the path takes you past Royal Pacific. The resort also offers a boat to Citywalk, which is an enjoyable ride. This resort offers two table service restaurants, one quick service location, and a poolside café. There is not a full Starbucks at this resort, but they serve a few Starbucks items at the quick service location. Parking is in a garage at $22.00 per night. There are several suites to choose from that will make your stay even more relaxing. Although it is a step up in the luxury scale and price, no Universal Express Pass is included with your stay here. This is a huge factor when deciding on a resort in my opinion. These passes totally change your entire vacation. Read on to find out how much they impact your day. The first Preferred level resort at USO was Loews Royal Pacific Resort. This is one of my favorites based on décor, amenities, and overall beauty. The theming is South Seas and the feel is carried all the way through the resort. I absolutely love the lobby and the elephant fountain. This resort offers three full-service dining locations, as well as two quick service locations. They also offer a fitness center, children’s play area, and a lagoon style pool with a sandy beach! Just beautiful!! All rooms will have two queens or one king and offer the choice of adding a rollaway ($25.00 per night) to either bedding choice. This means you can sleep up to five in a standard room. Royal Pacific also offers suites of varying levels to enhance your stay. There is a Luau offered weekly as well that gets great reviews. This certainly adds to the South Pacific feel of the resort. Parking here is also $22.00 per night. The most important feature is the Universal Express Pass that is included with your stay for each person in the room. This changes your entire vacation. I cannot even begin to explain the joy of seeing a two-hour wait for a popular ride or attraction and walking right past all of the scowling faces to the front of the line. On my most recent visit, I was able to ride both Harry Potter attractions with a five-minute wait. Instant happiness. This pass not only gets you to the front of the line once, but as many times as you would like. You can ride the Hulk until you match him in color if you so desire. This pass is pure gold. We have now reached Premier level status hotels!!!! The first is the Loews Hard Rock Hotel. This is the closest hotel to the parks. It is literally a five-minute walk to Universal Studios!! You can also opt for the boat, but walking is faster, plus it is a nice walk. Hard Rock offers two full-service dining locations and three quick service locations. Known for the not-so-subtle noise levels, Hard Rock offers you the chance to party like a Rock Star. You can even get a guitar delivered to your room! The pool has speakers underwater and you can sometimes catch live music performed there during the day. Volleyball and table tennis are also offered poolside, for those that have no intention of slowing down. Universal Express Pass is included with your stay here. Parking is $22.00 per night and valet is offered for $29.00. The rooms here are a true oasis from the hustle and bustle of the parks and offer the luxury a Rock Star would expect! These rooms all allow up to five guests with the use of a rollaway ($25.00 per night). This resort does have a reputation for being loud and busy, especially on the days they offer Velvet Sessions concerts in the lobby, but it’s a great option for those looking for a high-energy resort experience. 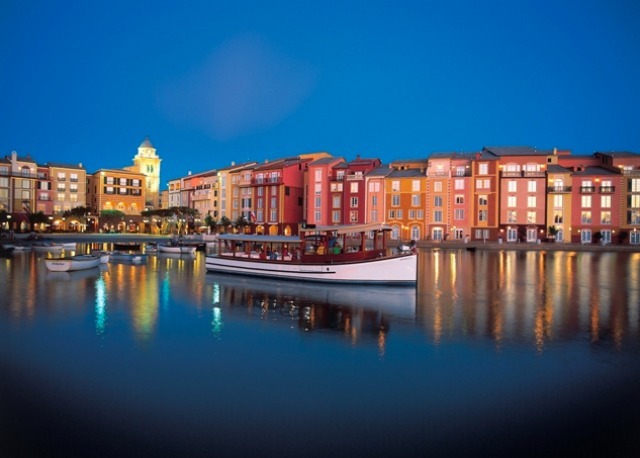 The pinnacle of the Universal Orlando onsite hotels and resorts is the Loews Portofino Bay Resort! This resort is the Premiere Level onsite hotel in all manners of the term. Themed after Portofino Italy, this resort has that breathtaking appeal that you want on vacation. The unassuming arrival area and lobby give way to the most spectacular piazza on the east coast. From the live opera music sang from a balcony to the amazing Mama Della’s restaurant, and all the way to the Gelateria (blueberry muffin flavor is the best), this hotel screams Italy! The rooms have Italian marble desks, huge bathrooms and amazing piazza views available. This hotel even offers Despicable Me kids suites which have the bomb beds! The Universal Express Pass is included here as well. It comes to great use when you can sleep in, have a wonderful breakfast by the water or at the Trattoria del Porto, and then take the boat to the parks. You have the option of walking as well. I can tell you when you ride the boat back to the resort, this is when you have that gasping moment of the beauty of the resort. This place is so unique in its design and atmosphere. The pool beckons as a refreshing oasis with a slide and fun kid’s area. If adult time is your cup of tea, they also offer two other quiet pools with the Villa pool being extremely elegant, and the Hillside pool being cozy. Oh, and yes there is a full-service Starbucks!! Parking again is $22.00 per night and valet is also offered. Portofino offers both surface and underground parking. In case you haven’t figured it out this is my favorite USO onsite hotel and I highly recommend it. Express Passes - you will want them no matter the time of year, but especially during high crowd times. A lot of the time it is less expensive to upgrade the hotel choice instead of adding on the passes. Plus, with the hotel, you get the passes for the day of check-in until the park close of check-out! Amenities - make sure the resort offers what your family considers important to them. You may need a Starbucks or more variety in dining than what some locations offer. All rooms will feature a small refrigerator, coffee maker, and free Wi-Fi. All Universal resorts and hotels offer at least two queen size beds. Price - Have Dreams Unlimited price more than one resort, and you will be surprised at the special rates Universal offers. A lot of the time the Portofino Bay comes in less than the Hard Rock! Location - staying onsite not only gets you closer to the parks but also Citywalk. 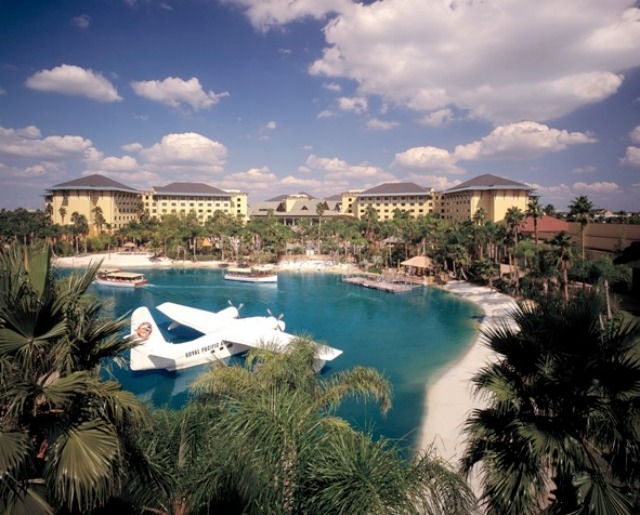 You will want to be fully immersed in Universal Orlando for your entire stay. or fill out a request form for a free, no-obligation quote located here.